Maybe you have a drone you like to fly outside and have thought, wouldn’t it be awesome if I could fly this in my house? 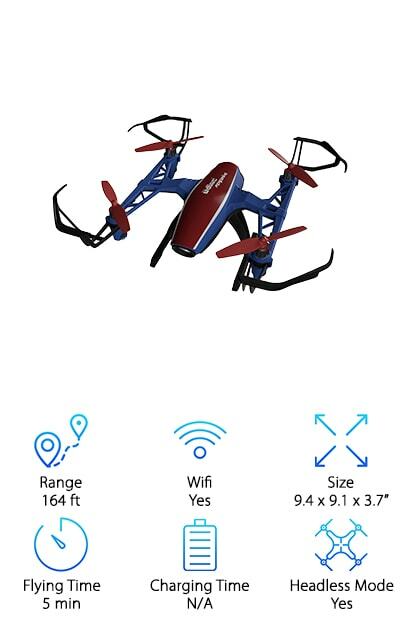 Well, with the best indoor drones, now you can. There are a lot of things to think about before flying a drone indoors. We researched some top sellers and best known brands to help you find the right one. Before we get started with our indoor drone reviews, let’s take a look at some key features. Range: This is how far your drone can fly from the remote. You should really consider this is you’re hoping to use you drone both indoors and out. Why? You definitely need more distance when you’re flying outside. WiFi: You don’t need WiFi to have an awesome drone. But drones that are equipped with WiFi have some really awesome extra features. 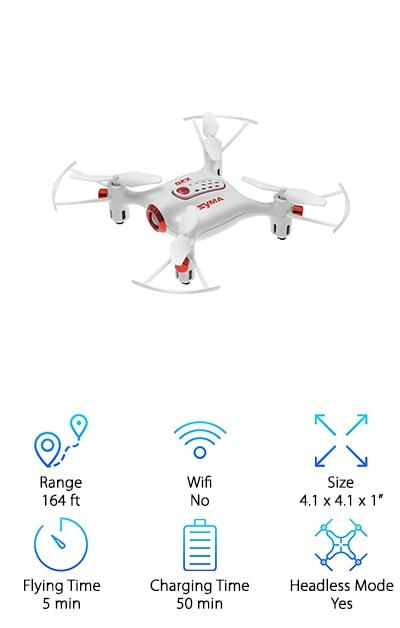 If you want a drone that you can pair to your smartphone, make sure it has WiFi capabilities. 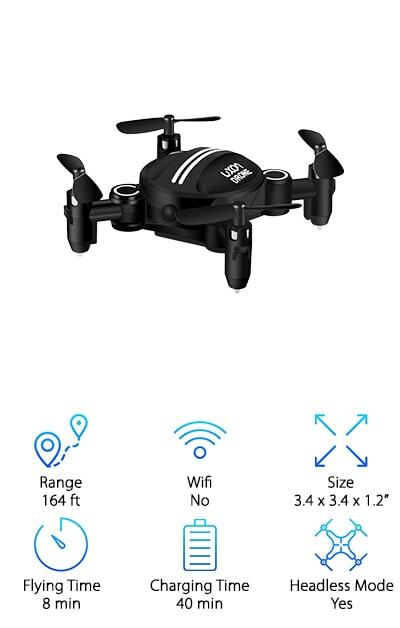 Size: We were really surprised by just how small some of these drones are, but it does make sense. Think about it: you don’t want something that’s too big if you’re going to be flying indoors near walls and furniture. Flying Time: Flying time varies a little but it’s usually around 5 - 10 minutes. If you’re thinking that’s not much, you might want to consider getting a spare battery so you can swap them out when it’s time to recharge. Charging Time: Speaking of recharging, this is the amount of time that the battery will take to get a full charge. Again, if you don’t want to wait that long, consider a second battery so you can still play while your wait. Headless Mode: Some of our picks have this cool feature that helps with control. Instead of having to worry about the orientation of the drone, the drone can match up to the control. So, you’ll always know which direction to go. Now that you know a little more about what to look for from our indoor drone buying guide, let’s take a closer look at the awesome products we found. If you’re in a hurry, make sure you check out the top 2 items first. 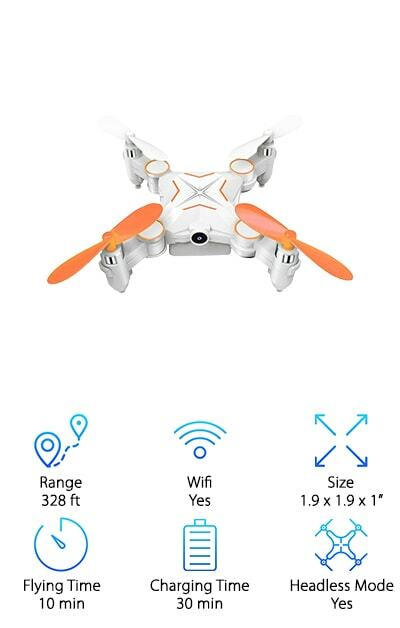 They’re our best and budget picks and will give you a nice idea of the range of drones that are available. Keep reading if you can! All of the products we chose are pretty great. Ready? Let’s go! The Holy Stone Predator Mini Drone is our top pick when it comes to best indoor quadcopter. One of the best things about it is it’s headless. That’s not only great for newbies just learning how to fly one but it’s also a good feature to have on a drone you’ll be flying indoors. Why? There are more obstacles indoors and having a headless option makes it a little easier to steer so you can avoid them. This drone is really lightweight so you don’t have to worry about FAA registration. It can do some cool things like flips and rolls thanks to the ultra-responsive motors, too. And get this: it’s equipped with LED lights so you can get some cool effects during night flights. If you’re looking for the best indoor drone that won’t break the bank, check out our budget pick. The Mini UFO Drone from Eachine comes with a lot of awesome features. Something we really like is the one key return. Just press a button and the drone uses its positioning system to return to the remote control. This is a great feature to have whether it’s flying inside or outside. Another cool thing is it can do a 360-degree roll-over. Plus, it’s equipped with colorful LED lights that help you identify the front and back for easier night flying. If you’re new to drone flying, there is a headless option. That makes it a little easier to steer, which will come in handy during indoor flying. 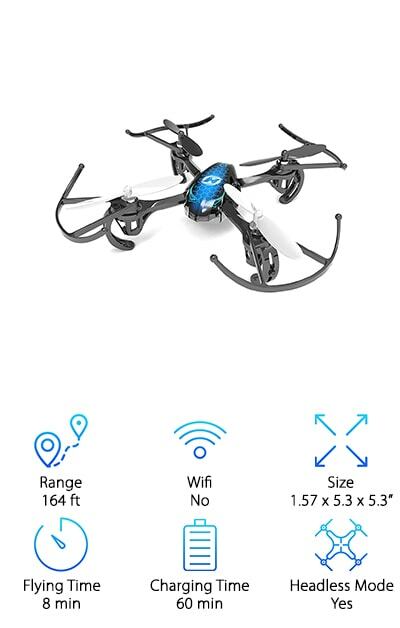 Our next choice for best quadcopter is the Rabing Mini Foldable RC Drone. 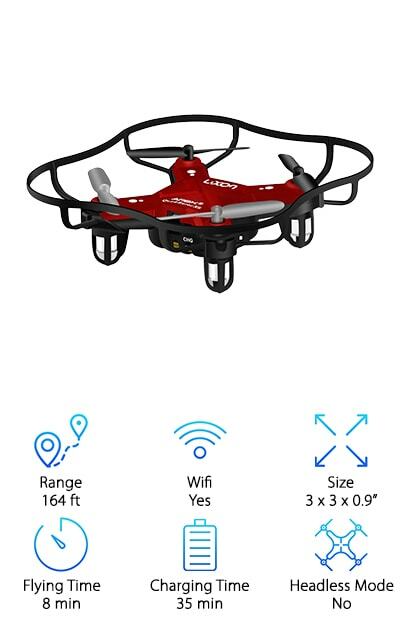 This is a great choice if you’re looking for good smartphone drones, too. 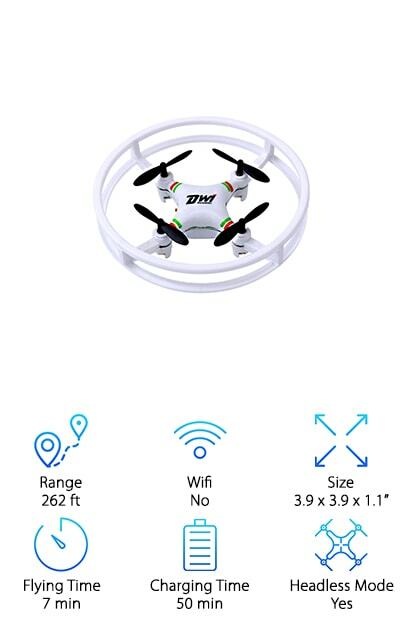 All you have to do is download the app to your smartphone, connect it to the drone’s WiFi, and you’re ready to go! And don’t worry - it’s available for both iOS and Android. You can also use your phone to snap pictures from the drone. There’s a regular remote control, too, if you prefer. 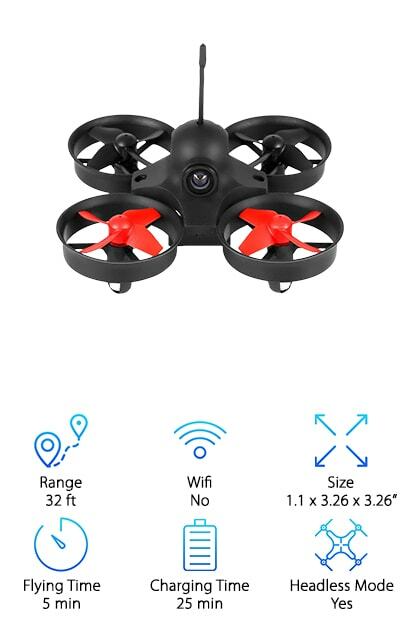 And get this: this drone also has a build-in HD camera so you can take awesome pictures and videos of your flying adventures. One more thing. As you might have already guessed from the name, this drone can fold up to a be even more compact. If you’re in the market for indoor drones, you have to check out the Luxon RC Indoor Mini Drone. After all, it says “indoor” right in its name. This drone has a really high-quality frame that can withstand a lot of dings and bumps. It can do some tricks, too, including a 3D flip and 360-degree rotation at the push of a button. There are 3 different speed settings so it’s a good choice for both beginners and experienced flyers. Not only that but it’s really compact and can easily maneuver around corners and other obstacles unique to indoor flying. Don’t worry if you bump into anything. The propeller guards protect you and the drone from damage. If anything does happen, though, there are 4 extra propellers included. For an indoor quadcopter that’s a good fit with users of any experience level, check out the Vandora Mini Pocket Drone. Why do we say that? For starters, the headless mode is great for beginners who are just learning how to steer. Plus, it was designed to resist interference and the 4-axis build gives it a lot of stability. The one key start and landing is really easy to operate and it can do 3D flips and rolls just by pushing the function button. You’re probably wondering what experienced user will like about it. The biggest reason is there are 2 speed modes. Learn on the slower one and after you’ve got a good grasp on controlling it, ramp up the speed for more excitement. The Force 1 Mini Indoor Drone is a great quadcopter drone for indoor flying. First of all, it’s really easy to fly. It has a lot of awesome features, including 1-Key take off and landing, headless mode, and a 6-axis gyro for steady flying. Another great thing is the altitude hold to help regain control if you’re losing it while flying. Though our favorite reason to use it is when taking photos or shooting video. You can just stop when you really want to focus in on something and get unique, stable shots. Because of this droid’s WiFi, it’s easy to control it with a smartphone app. And here’s the coolest thing about it: you can trace a path on your phone and the drone will follow it. 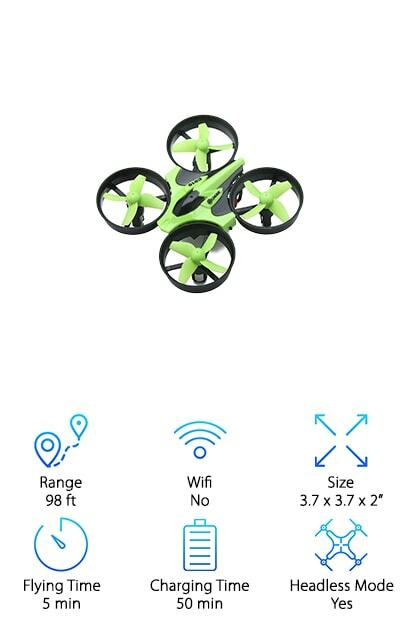 RC drones with cameras that you can fly indoors are pretty awesome and this OCDAY Mini RC Drone is no different. We love the HD camera, it’s really fun to take pictures and video while you’re flying it. Plus, it’s compatible with both Android and iOS devices. One-key return makes is super easy to land and is one reason why this is a good one to learn with. There’s a headless mode, too, which helps beginners learn how to steer without worrying about the orientation of the drone. Headless is also a good thing to use indoors because there are so many more obstacles than when you’re outside. We also really like the colorful LED lights to make flying in the dark a whole new experience. One of the reasons that the items on this list are great for indoor flying is because of their size. While they’re all small, the Dwi Dowellin Indoor Drone is one of the smallest RC quadcopters we found. It just about fits in the palm of your hand. This is a great choice for all skill levels. For one thing, it has 3 different speed settings. The propellers are protected with a frame to avoid any damage if it runs into anything while in flight. It also helps absorb the impact just in case of a fall. With maneuvers like one key 360-degree rolls and throwing flight, you never know when you’ll need a little extra protection. One more thing: LED lights for easy night flight. This Luxon Mini Drone is a fun one to play with, which might be why it’s geared toward kids. (We know adults will have a good time playing with it, too.) It’s already small to begin with but folds up even smaller so it’s easy to store just about anywhere. We love how the LED lights add to the fun of night flying. There are a lot of features that make this very kid-friendly. Headless mode lets you fly without worrying about the drone’s orientation. If you or your kid is having trouble landing or loses sight of the drone, one-key return brings it right back to you. And, at the touch of a button, you can have this drone doing rollovers and 360 degree flips. Last but certainly not least is the Syma X20 Mini Pocket Drone. This is another one that’s great for beginners and even kids. One thing we really liked about this drone is that it’s so stable. Why does that matter? It’s easier to control which makes it better to learn on. Plus, it has an easy to use headless mode and one key take off and landing. As for stunts, there’s also a one key 360-degree roll. And get this; it has an altitude hold mode. 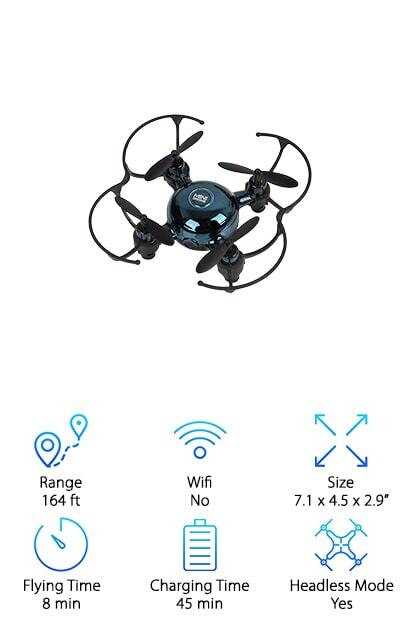 All you have to do is set it and this drone can hold its own height. If you want to fly it at night, the LED lights make it easy to see and create some really cool effects.